Legislators signaled strong support for UUP’s legislative agenda during a snowy Albany advocacy day Feb. 12, marked by concern for an Executive Budget proposal that leaves SUNY in dire straits. In a possible advance of their one-house budgets, which have not been released yet, several lawmakers and their staff members demonstrated a strong knowledge of SUNY’s situation and indicated that they are tired of seeing a great public university system beg for operating funds. The entire SUNY system, including SUNY’s three public teaching hospitals, has lost nearly $1 billion in funding in the last decade. “I’m horrified at what this governor does every year,” said Assembly Member Steven Englebright, a Long Island Democrat whose district includes Stony Brook and who is a Stony Brook University contingent and UUP member. He met with a UUP contingent that included Tom Hoey, the statewide membership development officer; John Leirey, the System Administration Chapter president and a UUP Delegate; and Stony Brook HSC Chapter members Jose Mejia and Sarah Battaglia. 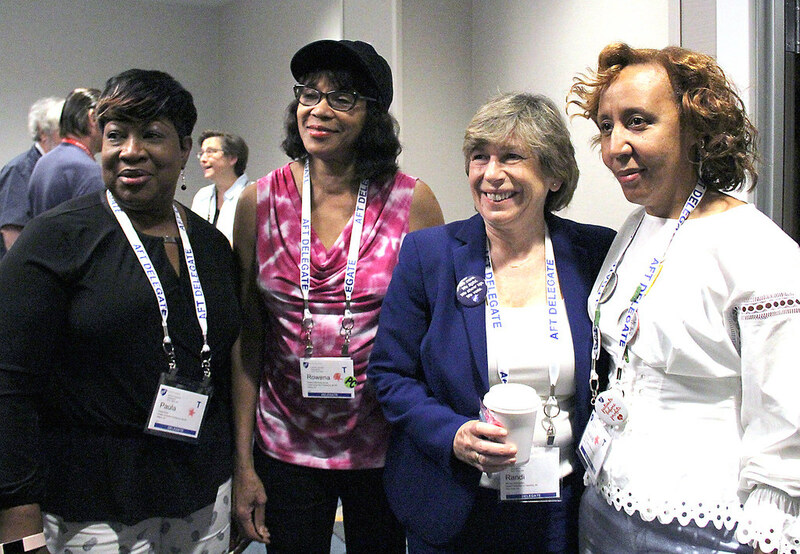 Hartshorn was joined Statewide Secretary-Treasurer Jeri O’Bryan-Losee, Downstate Chapter member Paula White, SUNY Poly Chapter member Rafael Romero, and System Administration Chapter treasurer Mike Walker. UUP is asking that the $62 million so-called “TAP Gap” be closed by having the state fully fund the Tuition Assistance Program. Campuses must make up the difference between TAP funding for their students and the balance of tuition. Hundreds of SUNY and CUNY students were set to travel to Albany Feb. 12 to advocate for SUNY and the University’s successful Educational Opportunity Program and the Educational Opportunity Centers. But a snowstorm canceled the students’ trip to Albany, as well as the annual Higher Education Action Day—which was expected to draw 800 SUNY and CUNY students from across the state. It was unclear whether the Higher Education Advocacy Day would be rescheduled before the 2019-20 budget is approved; the state’s fiscal year begins April 1. Instead, UUP members took students’ concerns to lawmakers. UUP President Fred Kowal, in remarks to members earlier that morning, before they set out for their meetings, called the situation facing the SUNY hospitals “life or death.” He said the hospitals will be hard-pressed to continue functioning without major cuts to programs if the subsidy is not restored. Hartshorn pressed DenDekker and a staffer for Sen. Leroy Comrie (D-St. Albans) to support the restoration of the $87 million subsidy. The SUNY four-year campuses received a flat funding allocation of $700 million in the governor’s proposal. Last year, the hospitals also lost their $87 million subsidy, but it was restored through a last-minute deal that allowed a one-time use of some federal funds. That is not likely to happen a second time. UUP members will continue holding district meetings with lawmakers throughout the legislative session, with the hope that a Democratic majority legislature that has already indicated a willingness to buck the governor on certain issues will do so again when it comes to taking a stand for SUNY.